OK, for those of you wanting to go to this Allergy FEST, it is being offered in Portland, Oregon! Let your friends know and pass this on to other pacific northwest people! This will be a great show. I eat a lot of Gluten-Free foods as they tend to be the ones that are soy-free as well. Not always, but I have a better chance with them. You will often see me in the Natural Food section of the grocery store looking at labels. 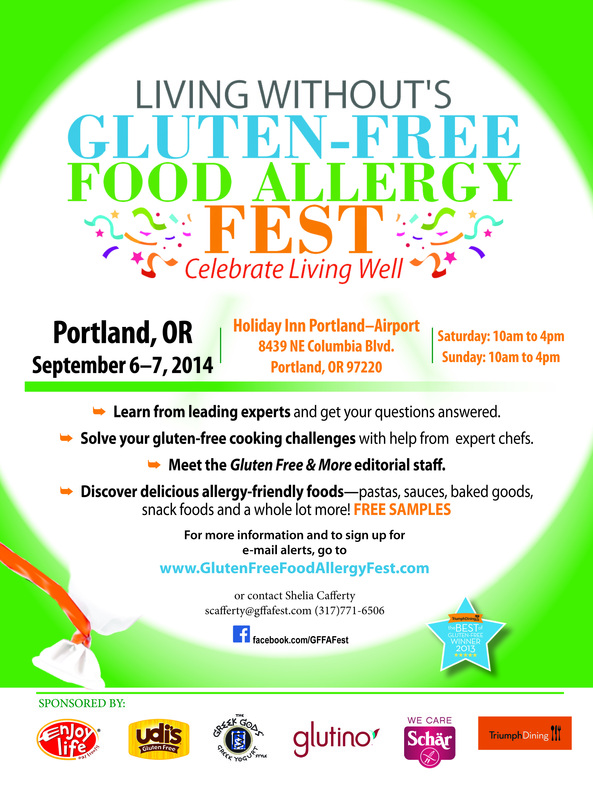 I love that there is an entire event around food allergies in one of my favorite cities too – Portland! If you are in the area, please attend and send me samples (ok, that was a shameless plug). 🙂 Seriously though, you should go. Enter for a chance to win a couple awesome tickets. this on to other pacific northwest people! This will be a great show. Disclaimer: This blog and any participating blogs did not receive compensation for the published material in this post. No purchase required to enter this giveaway and there is a limit of one entrant per household. Void where prohibited. Odds of winning are determined by the number of valid entries received. Winner will be chosen by Random.org and will be emailed via the email address used to enter the contest. New winner(s) will be chosen if original winner(s) has not responded within 48 hours of email notification. This blog and other participating bloggers are not responsible for shipment of prize(s). Sponsor(s) are responsible for all shipping costs related to prize(s). This giveaway is not administered, sponsored, endorsed by, or associated with Facebook, Twitter, Google, Pinterest or other social media outlet. Disclaimer is posted in accordance with the Federal Trade Commission 10 CFR, Part 255 Guides Concerning the Use of Endorsements and Testimonials in Advertising.